Tonight, and over the next three nights, I have four manis to share with you inspired by some nail polish jewellery kindly provided to my by Jewels made by Jess. I was so thrilled be able able to select a few jewellery items from Jess's store and then pick which polishes I would like to have set as the 'jewels'. I chose jewellery pieces and polishes that I knew I could match up with some of my work outfits, because I love going matchy matchy. Nothing gets more comments from my work mates than when I really pull it off like I did with these nail polish jewellery pieces. Matching my nails to the jewellery to my outfit, it rocks!. While nail polish jewellery have been around for ages for all us regulars in the nail polish world, let me tell you that my work mates were completely amazed at the appearance of all the items I have to so you. 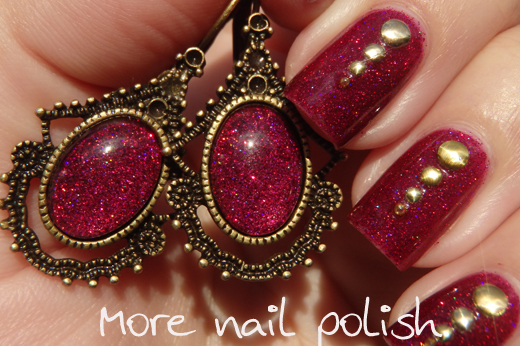 They couldn't believe glitter polish could look so awesome as jewellery. 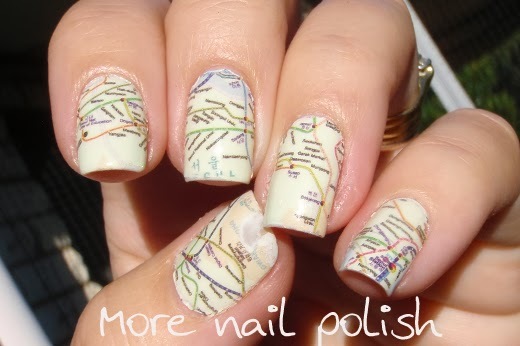 Considering my passion for polish it may surprise you that I didn't own an nail polish jewellery. I was actually so impressed and how beautiful all the pieces looked too. Oh and I forgot, on the fourth day I've got a giveaway from Jewels made by Jess with three prizes. So stay tuned for that!! Lets look at the first piece of jewellery. This is a set of earrings in design "L - Triangular Bronze" and I chose to have it set with jewels of Femme Fatale Fatal Attraction. 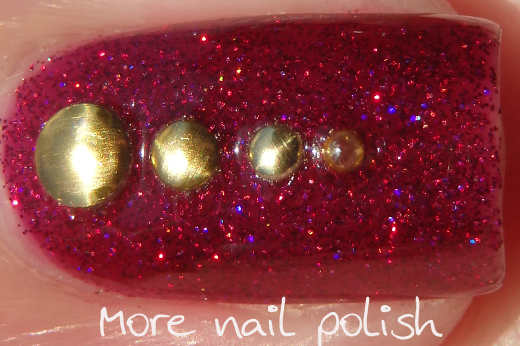 I matched my mani using three thin coats of Fatal Attraction and then placed gold studs decreasing in size on each nail. 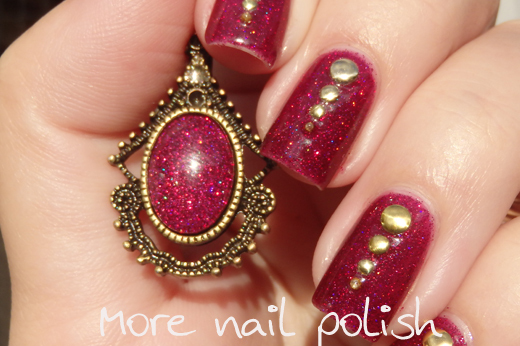 I loved the way the gold studs on my nails complemented the dotty effect on the earring. 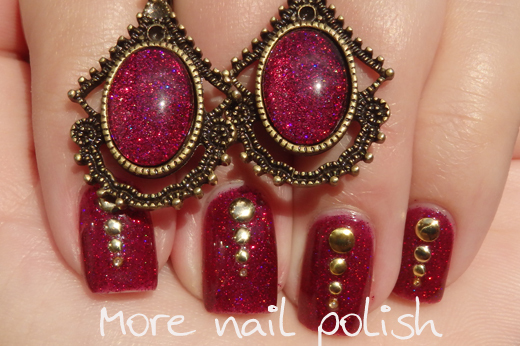 You can see these earrings made with other nail polishes on the Jewels Made by Jess Etsy listing for this item. Thanks for stopping by, and see you tomorrow for the new piece. 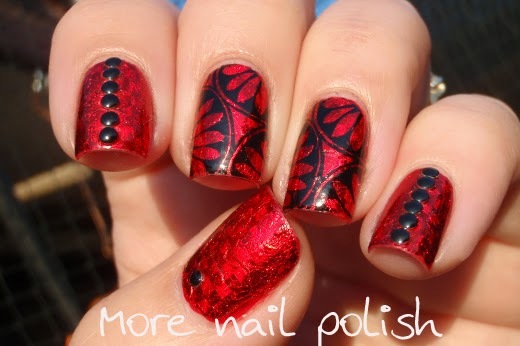 Another mani pulled from the vault. I think I wore this one a month or two ago. 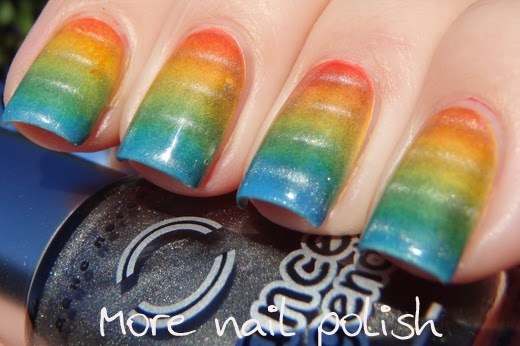 The mani features a three toned gradient and single coat of a glitter topper from Brazilian indie brand Penelope Luz. 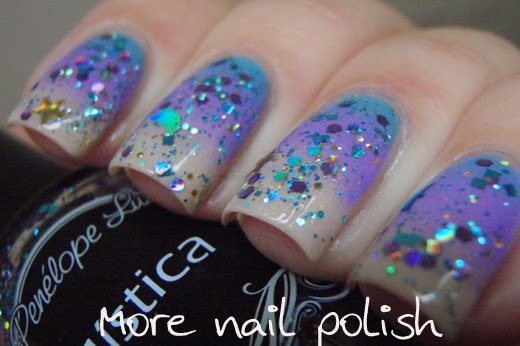 Mistica has purple, blue and gold holographic glitters in various shapes and sizes in a clear base. 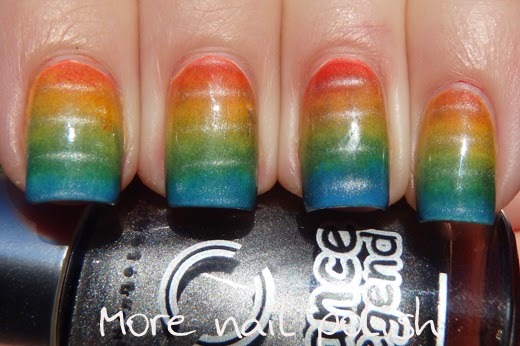 The colours in the polish inspired the colours of my gradient. I used OPI No room for the blues, Picture Polish Wisteria and beige. 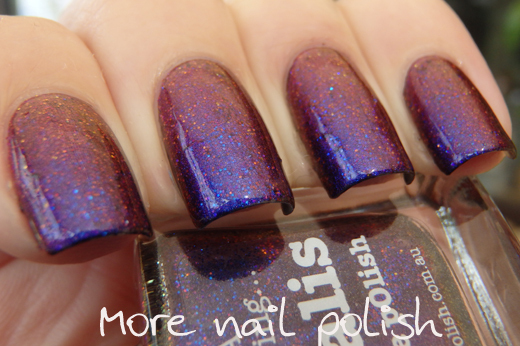 It's a gorgeous mix of glitters in this polish and photos really never do justice to holo glitter polishes like these. 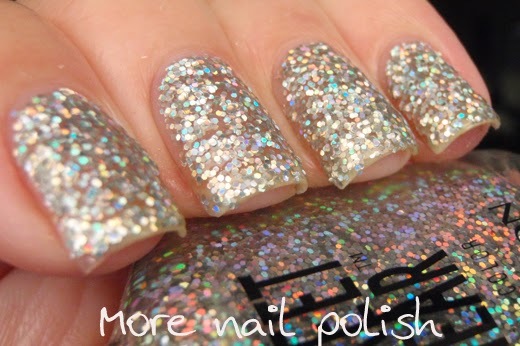 It has a good formula and great glitter payoff. 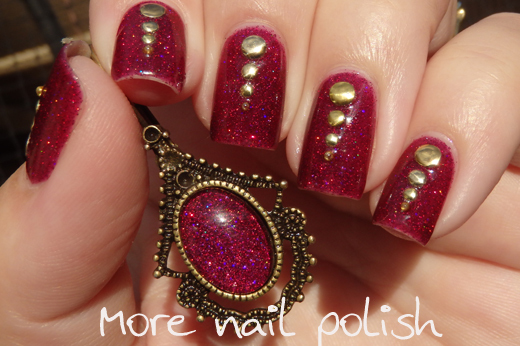 Penelope Luz polishes are available on the Penelope Luz site and they are also available through Color4Nails. Short an sweet tonight. Thanks for stopping by. 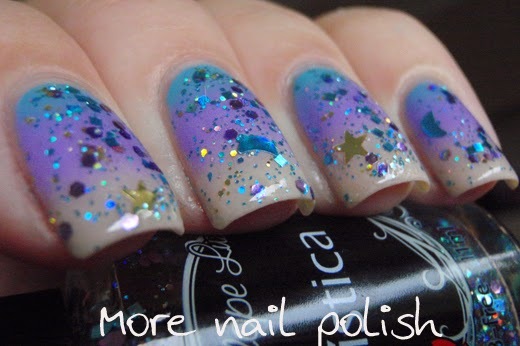 Last month Picture Polish released Aurora, which is a mix of multichrome pigment and multichrome glitter in one polish. 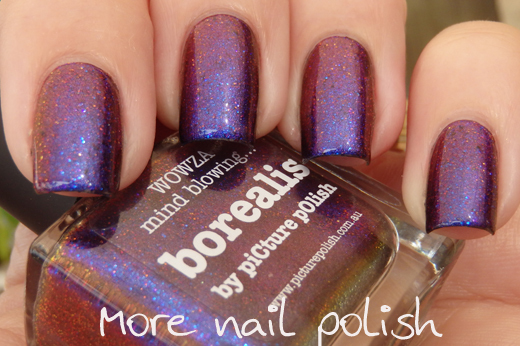 Tonight I have swatches of Aurora's sister polish, Borealis. 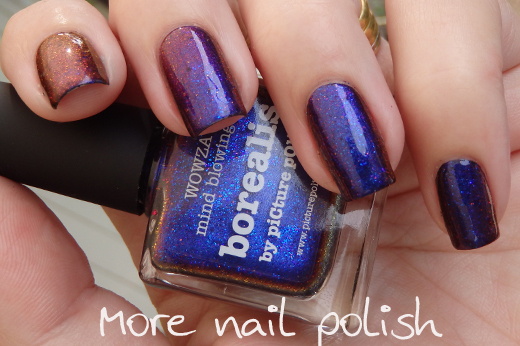 Borealis is also a mix of multichrome pigment and multichrome glitter, this time in the same colour range as Ozotic multichrome 504 and Picture Polish Altered State (and the number of other brand multichromes made from the blue to red Chromaflair pigment) it also has the same glitter that is in Ozotic Elytra 526. The colour shift goes from bright blue, to purple, to pink, to red and finally a bronzey yellow. 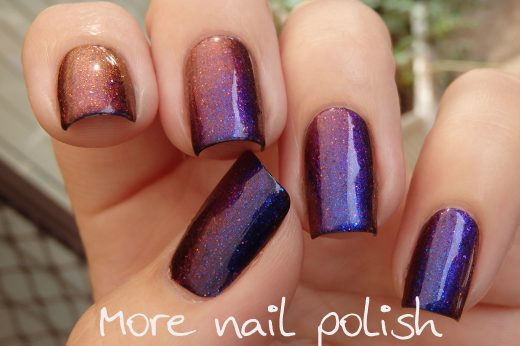 Application is nice and smooth, but it's worth noting, that just like Aurora, this polish is designed to be layered over a dark base. 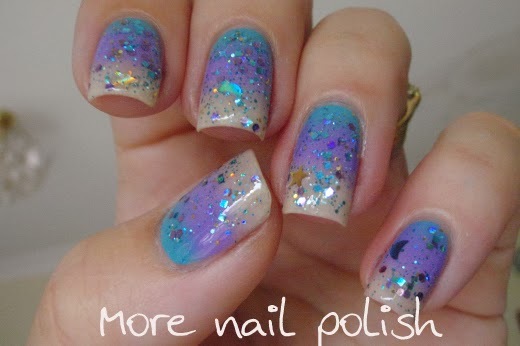 I can be built to opacity at about 3-4 coats and the finish is more pastel looking. Here I have layered 2 thin coats over black and topped it with Seche Vite. 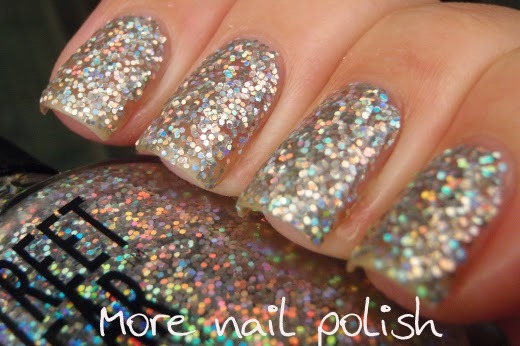 The colour shift is really strong and the mix of glitter and shimmer really makes the polish shine. The restock for the Limited Edition collection of Aurora, Altered State, Gravity, Illusionist and Solar Flare + launch of Borealis, Lizzie, Darcy and Bridgett is on this coming Monday 31st March at 9:00am, Brisbane Australia time, direct from Picture Polish (have you seen their new website yet?) International ladies should check their Network stockist for specific times! 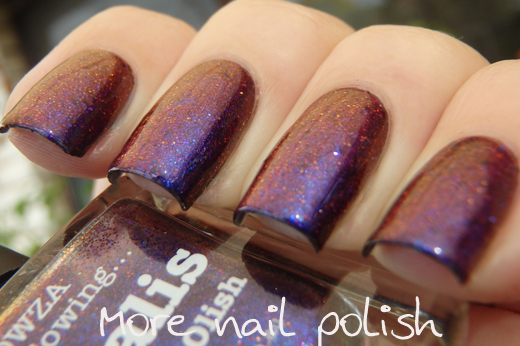 I'm starting to run a bit low on my draft manis that are edited and ready to post. I think I'm down to only three of four. I hate having that feeling that I'm falling behind and I need to catch up. I usually like to have at about 14 days worth of available manis to select from. I think I have a bunch of manis photographed on my camera that I haven't yet downloaded and edited, but the truth is that I've been to busy playing a new game on my ipad in my spare time over the last few days that I haven't been bothered to edit anything. I've been playing Plague. Has anyone else played it. It's a simulation strategy game where the purpose is to develop and mutate some sort of global plague, be it a bacterial one, a virus, fungal etc, with the purpose of infecting the whole planet and then wiping out the entire human race. It's like the reverse of real life where you want to work to stop a plague, so instead you're on the plagues side trying to kill everyone. So I've dragged myself away from my current plague for the moment to share a recent mani I created using some of the aEngland polishes. I think I used Tristam, Dancing with Nureyev and Fonteyn. 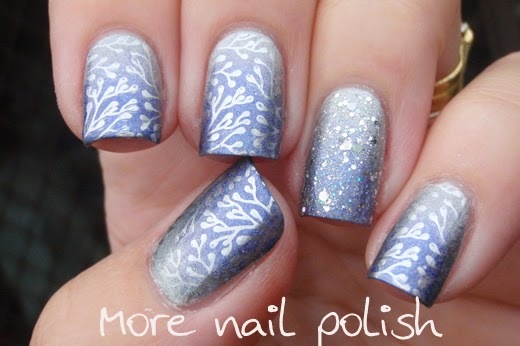 I don't recall right now which plate I used to stamp with, but I use Essie No Place Like Chrome for the silver. 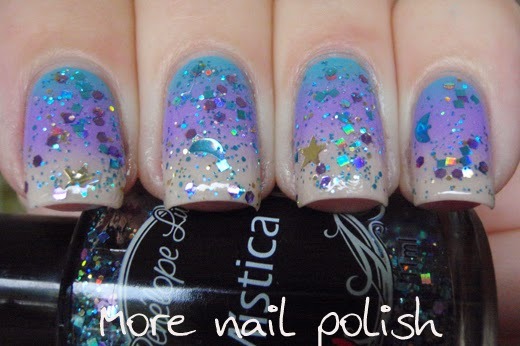 On my ring finger I applied a layer of Shimmer Alice. All rightly then, I'm off again to wipe out humanity on my ipad. 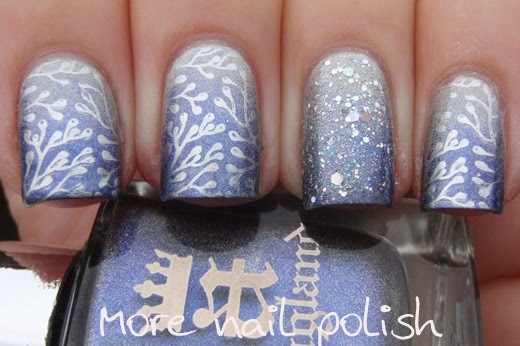 I have some cute water decals to share on my nails tonight. 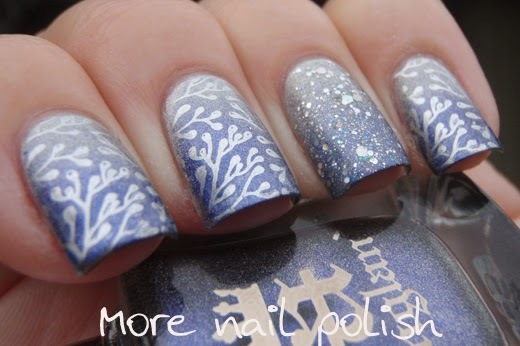 These are full nail water decals that I purchased from the Born Pretty Store. I wasn't sure if they were a solid colour or transparent from looking at them on the paper, so I did a base coat of white polish. It turns out they were fully opaque, so I didn't need the base, but I still like to have something down for the decal to adhere to. The subway map on these is for the South Korean subway, which I'm guessing is where these must be made. The writing is just a bit to small to actually make out what any of the stop say, but it did have large writing over difference sections. I thought these looked pretty fancy on. 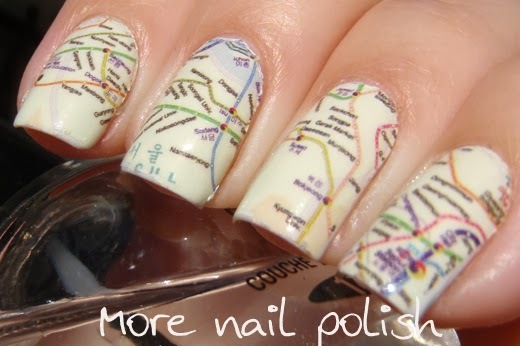 The only thing I didn't really like was that the sheet of decals wasn't big enough for me to do all ten nails easily. 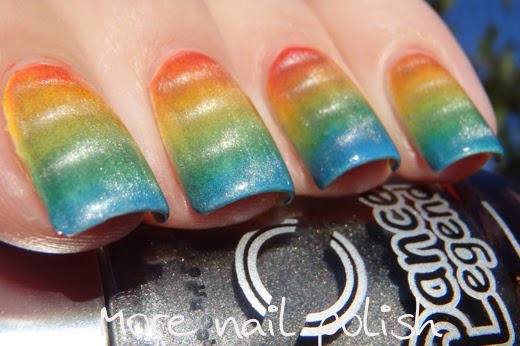 I really had to cut and change the angle of the decals on different nails (which I did on my right hand). 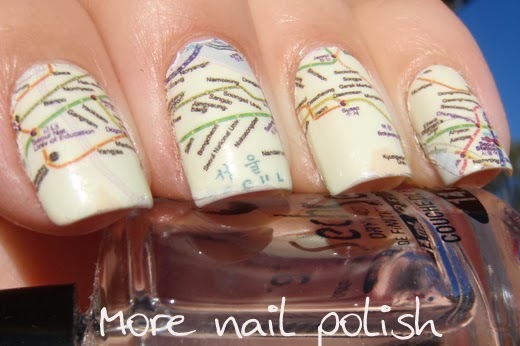 The little bid OCD part of me really hated that all then nails were therefore not facing the same way, with the subway map all connected up. This is item QQ-43 on the Vintage Letter Graffiti Map. Which of course is currently out of stock. 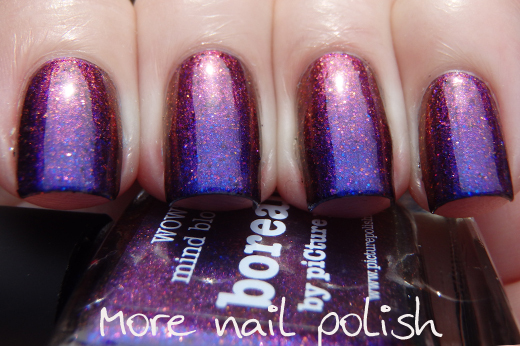 I really do like the Born Pretty Store for it's range of nail products and it's competitive prices, but unfortunately, their lack of speed in the processing and shipping time is really letting them down. You really need to plan ahead with your BPS orders. I was browsing around in my stash the other day and came across the handful of Revlon Street Wear polishes that I still had from the late 1990's. I thought it would be nice to wear these polishes again, as I've had them for so long and used to wear these all the time, but haven't touched them since my nail stash exploded four years ago. The most interesting part for me is seeing what colours I was attracted to purchasing way back then, and as it turns out, they are still my favourite colours to wear - golds and greens! Bare it - a light shimmery bronze in the sun, that appears more neutral in the shade and indoors. 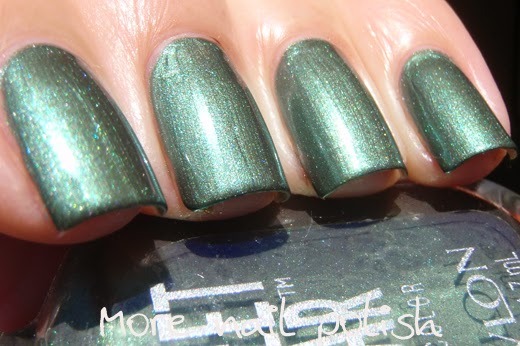 Deception - an metallic shimmery camouflage green. 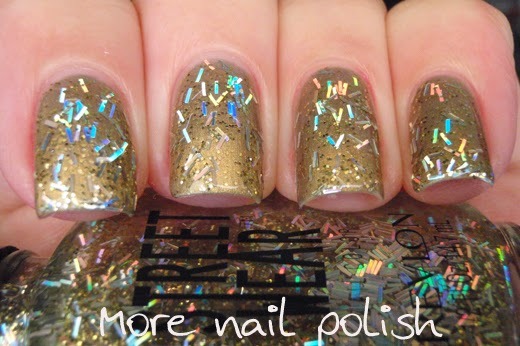 Gold Mine - a strong shimmery gold in a pale dusty grey base. It looks slightly duochrome in some lighting. 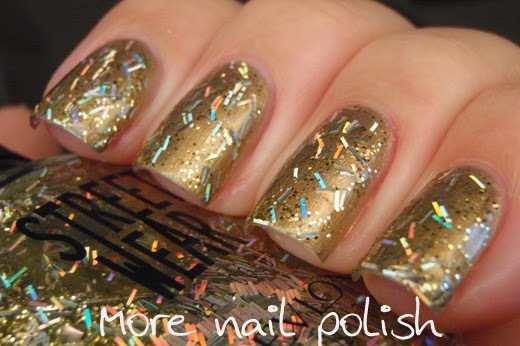 Midas - clear base with silver holographic bars and small gold hexes (layered over Gold Mine). Prism - Medium sized silver holographic hexes. Scheming -a warm toned, green leaning golden metallic shimmer. 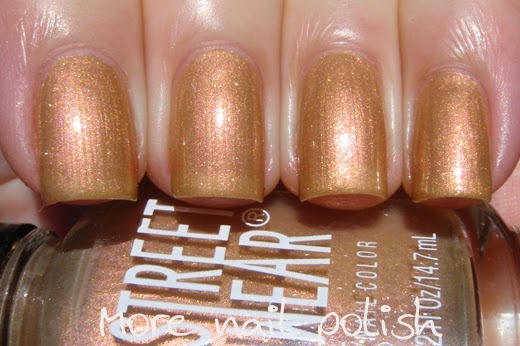 A lot of the old Street Wear polishes are still available on ebay today, and the prices range from about $5 to $30 per bottle depending on the shade. All of mine are still going strong, I did need to add some Seche Restore to the bottle of Prism, as it was quite thick and gluggy, but otherwise they applied well. 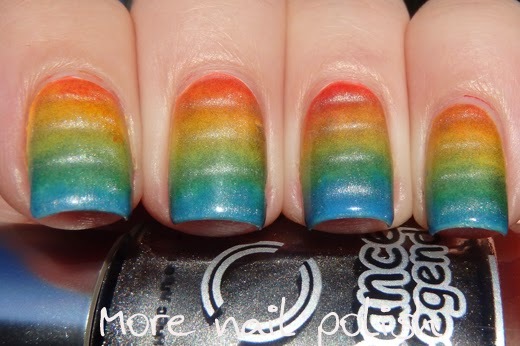 I'd love to hear about which Revlon Street Wear polishes you remember as your favourites, and if you still have some now. 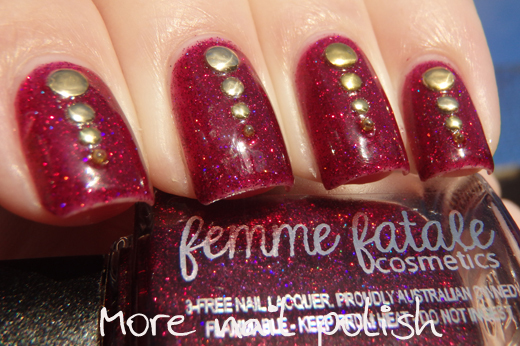 Here is something I wore a few weeks back when I was having an odd run of wearing red polish nearly every day. I started with a red base, which was Tuff Scent Rose smelling polish called Love. 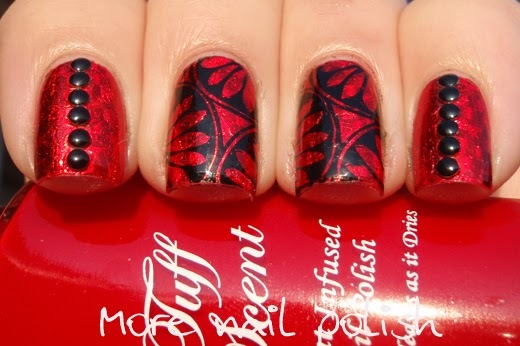 I then applied a red patterned foil and topped it with Picture Polish Revolution. Next was some simple stamping and black round studs. 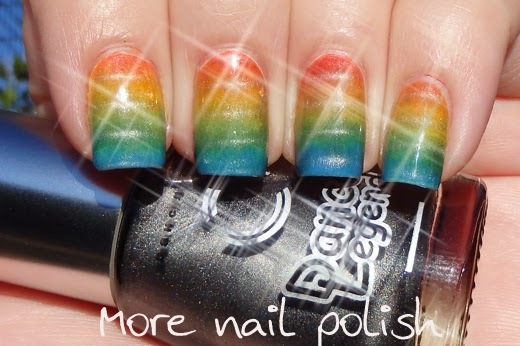 Quick and easy and quite striking. Sorry, I don't have much chit chat tonight. I've got house work I need to catch up on - whoo hoo pretty exciting stuff. 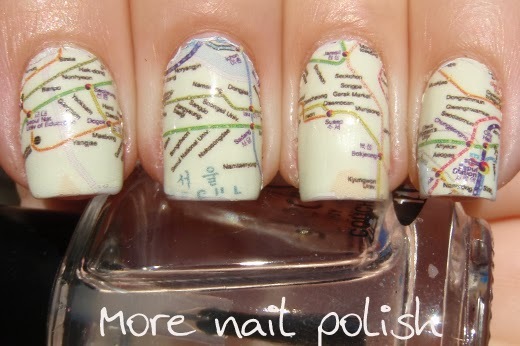 I'd much rather than playing with polish or writing on my blog.